As yet another war gets kicked-off in the Middle East, it may be time to reflect on what is gained (and lost) through endless war-mongering. Indians have in particular, suffered from centuries of war imposed upon them both by desi elites and foreign invaders. It also needs to be stressed that without the help of the British Indian army, there would have been no sure path to victory for the allies in 1918 or in 1945. The post-independence wars have been not been on such a grand scale as Panipat and Ferozepur Ferozeshah (thanks to Athar Saeed for the correction). On the other hand, it is now possible to envisage complete annihilation of the sub-continent, so we are not sure if this counts as progress. Late afternoon on January 14, 1761, Maratha generals and soldiers fleeing the battlefield at Panipat took with them an indelible memory of Ibrahim Khan Gardi's artillery and musketeers wreaking havoc on the enemy "like a knife slicing through butter". Despite their thinning ranks, the French-trained Telangi infantry, who called themselves Gardis in the honour of their illustrious commander, fought like true professionals. Though predominantly Muslim, they stayed loyal to the Brahmin Peshwa and fought a Muslim coalition, ignoring blandishments and threats till the very end. If all Maratha generals had stuck to the original plan drawn up by Ibrahim Khan-that of forming a hollow infantry square and forcing a passage to Delhi by destroying the Afghan right flank-the result of the Third Battle of Panipat could have been different. But despite the defeat, Panipat made it clear to the Indians that subsequent battles in the subcontinent will be won by the boom of artillery and rattle of musketry. According to Dr Uday S Kulkarni's exhaustive account of the battle titled 'Solstice At Panipat: 14 January 1761', Maratha generals like Scindia, Holkar and Gaekwad, who were staunch critics of Maratha commander-in-chief Sadashivrao Bhau's touching faith in Ibrahim Khan Gardi and his European style of fighting, would change their minds and increasingly repose faith in European-styled drilled infantry and artillery. In fact, they would also abandon their traditional strength of guerrilla warfare or ganimi kava, a process that started right from the Panipat battlefield. But the Marathas weren't alone in this: soon, most Indian rulers were racing one another to modernise their armies. This phase also saw a gradual departure from the mediaeval practice of assigning more weightage to cavalry than any other combat arm. But it was Nawab Shuja ud-Daulah of Avadh who was among the first to utilise lessons learnt at Panipat. He had allied himself with Ahmed Shah Abdali, but neither he nor his forces took any active part in the battle. In 1764, his moderately Europeanised army led by westerners-including Walter Reinhardt Sombre or 'Samru sahib', the husband of Begum Samru-gave a tough time to the English at Buxar, the first battle fought by the English for territorial control in India. Shuja's army also had Rohillas and Afghan cavalry, who were mostly veterans of Panipat. His artillery directed devastating fire on the British. But the British held out with the wily Hector Munro in command and some disciplined musketry by the infantry, the backbone of which was formed by over 5,000 sepoys. Shuja's forces, with all their bravery, had no answer for the Anglo-Indian bayonet charge. Indian history books today, while recognising Buxar as a watershed moment in our national history, skip another important point: that it was at Buxar that the identity of the Indian sepoy as a match-winner for the British was established (though four years earlier at Plassey, Robert Clive was disappointed with Indian officers and made it a rule that Indian troops will only be officered by Europeans-a condition that stuck on until the end of First World War). And it was at Buxar that the foundation of the Indian Army of today was laid. From that point on, the sepoy would be the backbone of English armies conquering different Indian states one by one. The English would gradually develop a blind faith in the Indian sepoy: a phase that would last until 1857 and continue again towards the end of the 19th century. For the Marathas, it was Mahadji Scindia who broke new ground in Europeanisation of his army. Scindia employed a brilliant French mercenary, Benoit de Boigne, to raise a brigade that could dress, march and fight as a European army. A former officer in the French, Russian and Honourable East India Company's armies, de Boigne taught Scindia's men the British musket drill and everything else that he knew on the condition that he wouldn't be made to fight the English with whom he had cordial relations. Mahadji's meteoric rise as the dominant power in the north of India hinged on the shoulders of this able Frenchman. Mahadji's new, formidable army came to be known as 'Fauj-i-Hind' or 'Army of Hindustan'. By 1790, it had 37,000 soldiers trained in the European fashion, and 330 pieces of artillery. But after Mahadji's death in 1794, his less capable grandnephew and successor Daulat Rao Scindia would fritter away the gains of his predecessor. He would wage fratricidal wars with other Maratha chieftains and lose both territory and reputation fighting the British. His army stopped attracting talent, both due to his own apathy and some shameless nepotism practised by his French general, Perron. But they would still give Arthur Wellesley, the future Duke of Wellington, his "toughest battle" at Assaye. Elsewhere in the south, Nawab Hyder Ali was raising a formidable army. Hyder was impressed with the British and wanted their military assistance to modernise his army. The British were reluctant, which led Hyder to seek help from the French. With French help, Hyder modernised his infantry and artillery, but unlike other Indian powers of the day that ignored cavalry, Hyder's focus was always on his cavalry and he used it with great skill, always leading it from the front. In fact, the Mysore cavalry, with its dash and daring, had built for itself a fearsome reputation among its rivals. In the 1770s, Hyder Ali had 20,000 cavalry, 20 battalions of infantry and an unknown quantity of guns. Even the English grudgingly admitted Mysore cavalry's superiority, though they referred to its actions as that of a swarm of locusts on crops. Hyder Ali and Tipu Sultan also abandoned the common Indian practice of engaging militias raised by provincial governors in war time and went for a fully centralised recruiting and training system. A very rudimentary form of regimental system was also followed. But by Tipu Sultan's time, Mysore artillery had attained a high degree of finesse. Tipu introduced a rocket artillery corps organised in kushoons. Tipu's guns were also known for their longer range and accuracy. It's not known how many artillery pieces he had; but at the fall of Srirangapatnam and Tipu's death in 1799, the British found 421 gun carriages, 176 12 pounders and 4,12,000 iron round shots ranging from four to 42 pounds inside the fort. Ranjit Singh wanted to modernise his army. The visionary ruler knew a clash with the British was inevitable at some point in the future and he wanted to be fully prepared for that. He employed Europeans of different nationalities to train his troops. Ranjit Singh organised his infantry on French lines, cavalry on British as well as traditional lines, and artillery on European lines. The English were so alarmed by this tremendous expansion of force that they ordered the arrest of any Frenchman trying to cross the Sutlej. All through the war, the Sikh commanders abandoned the field, leaving their men to fend for themselves, at early stages of battles. 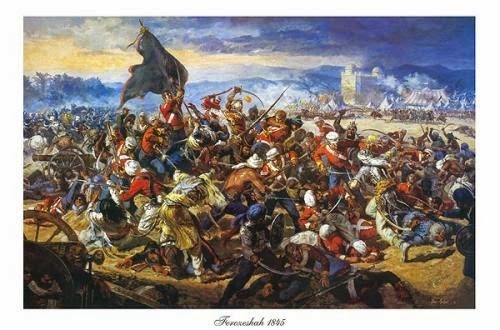 At Ferozeshah, for instance, the Sikhs had clearly dominated the battlefield with their artillery completely destroying the British artillery, and infantry returning fire with amazing rapidity. Sitaram, a sepoy in the British army, as quoted by Singh in his book, pretty much summed up the ground reality when he wrote: "Volleys of musketry were delivered by us at close quarters, and were returned just as steadily by the enemy. In all the previous actions in which I had taken part one or two volleys at short range were as much as the Sirkar's (the British state's) enemies could stand; but these Sikhs gave volley for volley, and never gave way until nearly decimated..."